The first time I tried to make a pumpkin pie truly from scratch, as in cooking an actual pumpkin for the puree instead of using a can opener to get some of Libby’s finest, I killed my microwave. I’m not sure how I did it. I cut up the pumpkin into slices as the recipe directed, put them in the microwave, and hit 15 minutes. I watched the pumpkin slices slowly rotate on the shiny white plate I had placed in the microwave moments earlier and then went back to doing some other kitchen prep work. When the microwave dinged, I pushed the black button to open the door, tried to stick a fork into the slice, and noticed the pumpkin hadn’t softened at all. So I closed the door, pressed 5 more minutes and walked away, a little annoyed that the recipe would be as off in its timing as it was. The microwave dinged again, and the pumpkin slices were still hard as a rock. I did this two more times until I realized the microwave wasn’t working anymore. And that’s when I started to panic. See, AJ and I were prepping for our annual Thanksgiving feast. 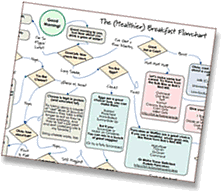 We made a pledge years ago to always throw our own Thanksgiving feast after a miscommunication with a friend left us high and dry without a Thanksgiving dinner to go to. Yes, that was a dark year for us: No turkey, no mashed potatoes, no stuffing or pumpkin pie on the last Thursday of November. As we sat on my studio apartment floor, with a couple of steaks and frozen broccoli we had scrounged up from the local corner store (desperate times called for desperate measures…buying meat from a corner store) we vowed that no matter who came to our Thanksgiving dinner, whether it was just the two of us, or a grand party of all our friends, we would ALWAYS make a Thanksgiving diner, completely with roasted turkey, stuffing, mashed potatoes, green beans, sweet potato casserole, gravy, cranberry sauce, and pumpkin pie. We’ve stuck to that plan, though the menu has shifted now and then (a few extra desserts, a vegetarian main course, a brussels sprouts & cauliflower au gratin that I tried out one year and fell in love with and have since made every year). We’ve made the feast in AJ’s apartment when his roommates were out of town, leaving us alone to try to eat the turkey with all the fixin’s (talk about leftovers), and we’ve made Thanksgiving dinner for 13 people crammed into our tiny little one bedroom apartment in San Francisco, two of whom were vegetarian (and one of whom had never actually had gravy in her entire life, something I made sure to fix at that meal). And here we were prepping for our Thanksgiving party of eight people. And our microwave just died. And though people have been making Thanksgiving dinner without a microwave for years, we were not ready to make that leap of prepping ALL the food at the same time, hoping it would be hot enough to serve. On top of which, I did NOT have any back up plans for a dessert. All I had was a very hard pumpkin and a ticking clock. I was eventually able to salvage the pumpkin by roasting it in the oven (it took longer but in the end, I realized that I liked that method better anyway so it probably worked out for the best). We borrowed a microwave from a friend that lived a couple of blocks away the next day so the dinner went relatively smoothly without any more bumps. That year, I discovered that making your own pumpkin puree is actually pretty darn easy to do. Slice the pumpkin, brush it with melted butter so it doesn’t dry out, and stick in the oven until soft. It’s about as “unprocessed” as you can get. I’ve never gone back to the canned stuff, which often times tastes metallic and pasty to me after tasting the homemade stuff. On top of that, one of my go-to recipe for pumpkin pie is sweetened with maple syrup, one of my favorite unprocessed sweeteners, which lends a wonderful deep autumn flavor to the pie, evocative of yellow, red and orange leaves turning on the trees. Turning the crust into something “unprocessed” is pretty easy too, substituting white whole wheat flour (an albino varietal of wheat grain that has a more mellow flavor than regular red wheat flour, the predominant wheat grain, and is used to make white and whole wheat flour and that is becoming easier to find) for the regular white flour. I’ve often substituted white wheat flour for plain white flour in recipes when I want a little more texture or nuttiness, but not the same pronounced bitterness that whole wheat flour can lend to the baked good. October Unprocessed is nearly coming to an end, but that doesn’t mean you have to immediately run out and eat a huge slice of sugary dessert. With a little adaptation, baked goods and desserts can be made with unprocessed ingredients. I am firmly in the camp that desserts aren’t supposed to be “healthy” or “low fat” as I would rather eat a satisfying smaller slice of something rich and decadent than a large slice of something “low fat” and mediocre that leaves me unfulfilled and wanting more. However, decadent and rich doesn’t necessarily have to mean processed and empty calories. 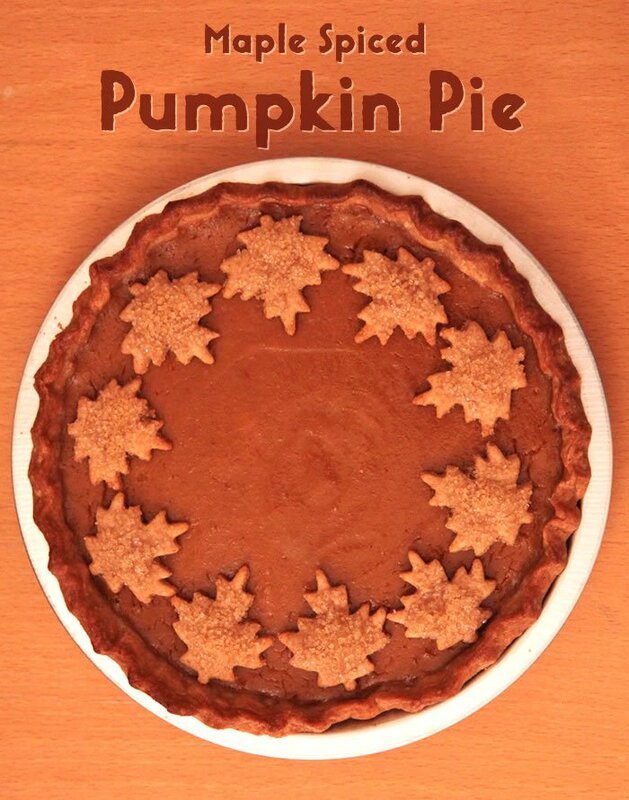 Try this pumpkin pie. I doubt you switch back to the Libby’s and condensed milk version. I know I didn’t. Pie crust is adapted from More Best Recipes from the Editors of Cook’s Illustrated This recipe makes two crusts. You can split it in half or you can just make two and freeze the second one for later use (frozen pie dough is awesome to have on hand). Cut each pumpkin into 6 to 8 wedges. Scrape the seeds and stringy stuff out. Save the seeds to toast if you want, or compost/dispose of it. Don’t bother being too meticulous cleaning out the stringy inside. Once you roast the pumpkin, it scrapes out easily. Brush the pumpkin flesh with butter. 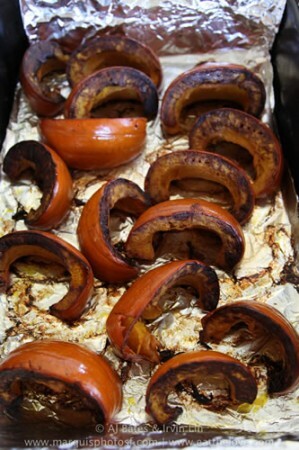 Place each wedge on its side in a large roasting pan and cover the roasting pan tightly with aluminum foil. Bake for an hour and then turn the wedges onto their other side and roast for another hour or until the flesh is very tender when stuck with a fork. Cut off any burnt bits and scoop out the flesh into a food processor. Puree the pulp until smooth. Transfer pumpkin pureee to a sieve or colander lined with several pieces of cheesecloth set over a large bowl. Cover the top with plastic wrap and let drain 8 hours or overnight. Note 1. Be sure to use a small sugar pie pumpkin NOT a large pumpkin you would buy for a jack-o-lantern. The large ones are pretty to look at but flavorless and stringy. Note 2. Step 6 is done to let the pumpkin puree thicken as there is a lot of moisture in the initial puree. If you are in a hurry, you can skip this step and instead line a baking sheet with three layers of paper towels. Put the puree on the paper towels and pat the pumpkin puree down, absorbing the moisture. You can flip the pumpkin back and forth with the paper towel, until the paper towel is completely saturated. Your pumpkin puree is ready to use. Note 3. Pumpkin puree is pretty easy to make in bulk, so feel free to double or triple this recipe. The puree keeps for a couple days in the fridge or freezes in a ziplock bag/airtight container for up to two months. In a food processor combine the flour, sugar (you might want to initially crumble the sugar around, as it will stick together), and salt. Pulse three or four times to combine. Cut the butter into ½” cubes and sprinkle around the flour mixture in the processor. Pulse 10-12 times to get butter the size of peas. Mix the water and sour cream together with a fork until smooth. Pour half into the processor and pulse three or four times. Add the rest of the mixture and pulse again three or four times. Check the dough. If it’s not coming together and is dry, add a tablespoon or two of water. You want to make sure the dough comes together as you pinch it with your fingers. Divide the dough and then flatten them into disks. Wrap with plastic wrap and put them in the fridge to rest for an hour or overnight. Before using, take out of the fridge and let it sit at room temperature for 5 minutes for easier workability. Note 1. Why the sour cream? An all-butter crust has a habit of becoming heavy and greasy. The extra fat and acidity of the sour cream helps keep the crust tender. Note. 2. You can easily make this crust dough overnight or freeze it. Roll out the dough for a deep dish 9” pie pan of your choice. Fit the dough into the pan and decoratively flute the edge of the pan however you want. Prick the bottom of the dough with a fork all over. Bake for 12 minutes. Remove from oven and lift the paper/foil gently directly up from the pie crust very carefully. Put the paper/foil filled with the pie weights in a bowl and put the pie crust back in the oven for another 5 minutes or until the crust starts to look dry. Once the pie crust is out of the oven, take the maple syrup and gently boil it in a heavy saucepan. Bring the maple syrup to 240°F (the soft ball stage – when a small amount of syrup dropped into a bowl of cold water forms a soft ball). Put aside to cool a little bit. In a bowl whisk together the pumpkin puree, all the spices, salt, cream, milk and eggs. Then whisk in the maple syrup. Pour the custard into the pie crust shell. Bake the pie in the middle of the oven for 50 minutes or until the filling is set but still shakes slightly. It’ll set as it cools. Cool on a rack to completion. Note 1. Maple syrup in the US is broken down into Grade A and Grade B, with Grade A being further broken down into Light Amber (sometimes called Fancy), Medium Amber and Dark Amber. Grade B maple syrup is darker than the Grade A Dark Amber syrup. It has a more distinct, stronger maple flavor. You can find it at specialty stores or places like Trader Joe’s. Note 2. If you are using a regular 9” pie pan not a deep dish pie pan, you can probably cut the custard recipe in half and have enough filling for it. Bake the pie for 30-35 minutes. Note 3. 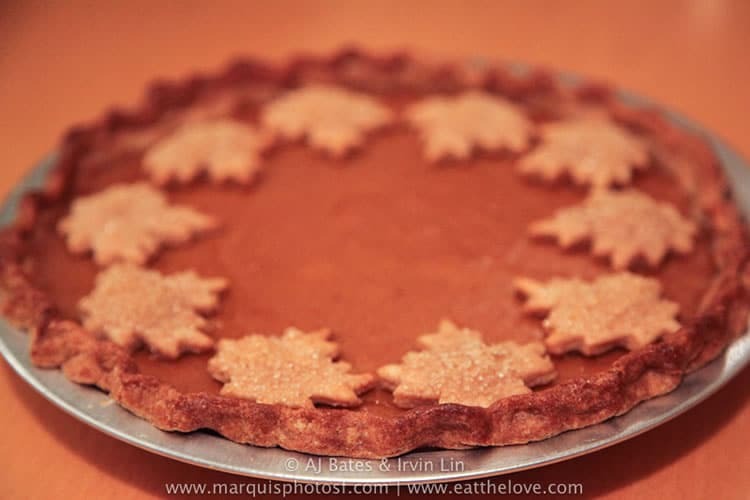 If you have left over pie crust dough, gather it up and roll out it out again and use a cookie cutter in the shape of a maple leaf to cut little maple leaves to decorate the pie. Brush the maple leaf with an egg wash of 1 egg yolk and 1 Tbsp of water whisked together. Then sprinkle the leaves with maple sugar if you have it, or turbinado sugar. Bake with the pie crust when you are blind baking. Take them out at the 12 minutes mark. Garnish the pie with the pastry leaves just before serving. Just as an FYI, this also is useful if your pie custard happens to crack and you need something to cover it up! Note 4. If you must use the canned stuff (yeah, go ahead, I won’t tell) use the trick that I gave about taking some moisture out of the puree by rolling it around on the paper towels. The less water in the pumpkin puree, the more concentrated the pumpkin flavor. Thanks for the kudos on October Unprocessed… It was an enlightening month for many of us (self included)! Although I’m not spearheading an unprocessed November, I certainly encourage you to give it a shot on your own (or better yet, with some close, like-minded friends). Hooray for real food! Ooh, how beautiful, and it sounds delicious!! I am a big fan of Irvin’s; where he leads, I will follow. I am increasingly interested in unprocessed everything. I am super glad to find out about this and will check the other recipes out! Thanks!! So yummy! I used almond milk instead of the cream and cow’s milk because of a milk allergy but will definitely try it again as written. I served it with whipped cream from those who aren’t allergic and chopped Sahale dried cranberry/black pepper/orange zest pecans. Definitely trying this with the whole wheat crust and maple syrup. I plan to substitute sweet potatoes for the pumpkin, since I use similar ingredients for both. Thanks for this awesome recipe. How will the pie be of made the day before?